Drew Melanson and Jake Oettinger were Hockey East Monthly Award winners for March for their post-season performances. 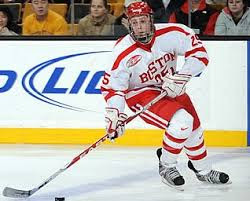 Grad transfer Melanson earned player of the month with key goals against UConn and BC in the Hockey East tournament and against Cornell and Michigan in the NCAA Regional. He finished the season with 19 points. Oettinger was named Stop It Goaltender of the Month after back-boning BU to five consecutive post-season wins, including a shutout in the Hockey East tournament title game. In the latest entry of his Draft Diary, Brady Tkachuk looks back at his freshman season and ahead to the NHL Combine in May. 2019 recruit Trevor Zegras, scored his 19th goal and had an assist as the U17s fell to Muskegon, 5-4. Zegras also scored a goal and added an assist in Thursday’s 6-2 win against Youngstown. The center from Bedford, N.Y., now has 53 points in 48 games. 2019 recruit Robert Mastrosimone scored his 16th goal and added an assist as USCHL Chicago defeated Central Illinois, 6-4. 2020 recruit Donovan Sebrango has been named to the All-HEO team for the upcoming OHL Cup. The 5’11” defenseman, who had a 5-20-25 scoring line for CIHA White this season, was a second-round pick by Kitchener in the recent OHL Priority Draft. Jordan Greenway recorded his first Stanley Cup playoffs point, setting up linemate Matt Cullen in Minnesota’s 3-2 loss to Winnipeg. Danny O’Regan scored a goal and assisted on two others in Rochester’s 6-4 win against Belleville. O’Regan, traded from the Sharks organization to Buffalo during the season has 40 points. Former BU All-American and 2009 NCAA championship Most Outstanding Player Colby Cohen traces the path that took him from playing in the NHL to the broadcast booth with recent stints analyzing action at the Olympic games in the Stanley Cup Playoffs.